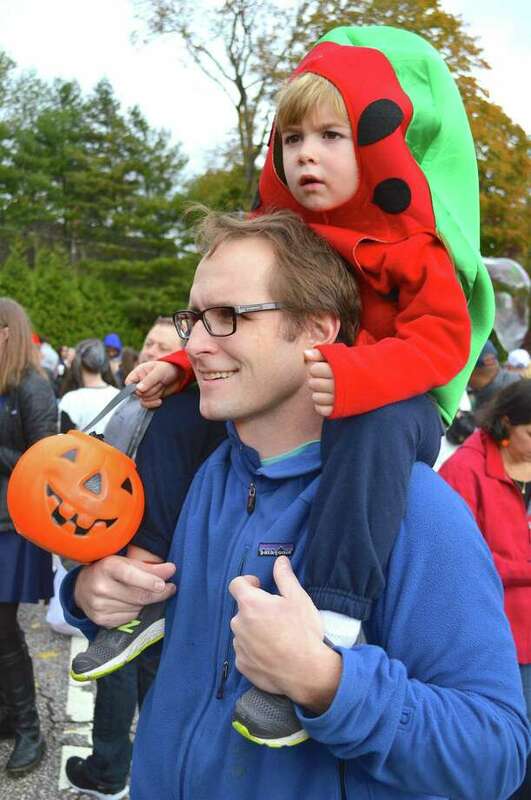 Chris Mattern of New Canaan and his son, Charlie, 4, enjoy some music at the Park Street Lot at the 40th annual Chamber of Commerce Halloween Parade event on Sunday in New Canaan. There were hundreds of kids and adults in costume, gathering at the Park Street Lot for a musical performance by New Canaan School of Rock, and a very popular bubble exhibition by My Balloon Guy Scotty Kazan of Stamford. At 1 p.m., the Old Faithful antique firetruck led a very informal parade down Elm Street, but the crowds lingered and even increased as kids enjoyed an early opportunity to hit dozens of stores for tricks or treats.